The last decades of the twentieth century have witnessed, as part of the second demographic transition affecting most industrial countries (Van de Kaa, 1987), two features of particular interest here – a delay in entry to motherhood and an increased chance of women being employed even after they have children. In Britain, these trends have not been experienced uniformly across the social spectrum. 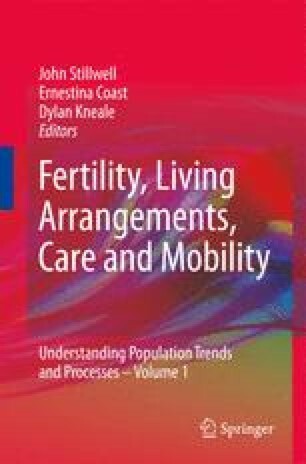 The research reported in this chapter attempts to establish links between these two phenomena, to quantify the extent of social differentials (in the timing of first motherhood and maternal employment) and to investigate their impact on the development of children. Department for Education and Skills (2006) Provision for Children Under Five Years of Age in England: January 2006 (Final), This Statistical First Release updates and extends the information provided in SFR 17/2006 Provision for Children Under Five Years of Age in England: www.dfes.gov.uk/rsgateway/DB/SFR/s000674/release.shtml is contained in www.dfes.gov.uk/rsgateway/DB/SFR/s000674/index.shtml. Rendall, M.S., Joshi, H., Lynch, K., Ekert-Jaffe, O. and Mougin, R. (2008) Universal versus economically polarized change in age at first birth: a French-British comparison, Rand Corporation Working Paper WR568, http://www.rand.org/pubs/working_papers/WR568.